The best way to find out is to make sure there is dye in the system. Then you will be able to find the leak. 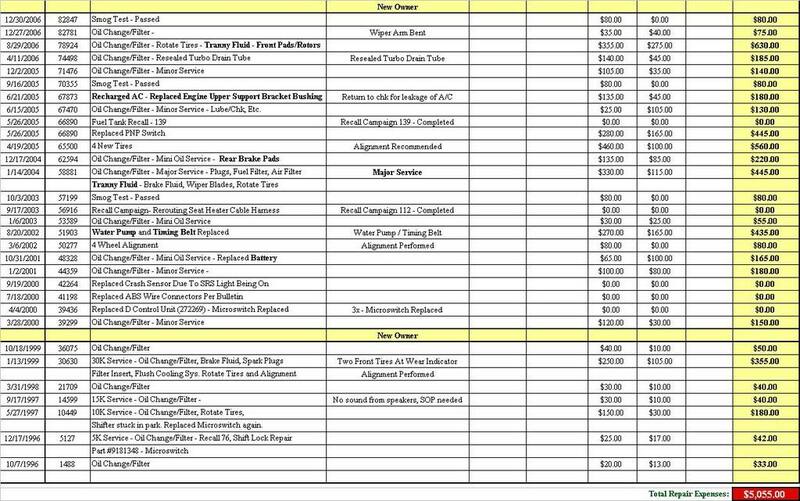 About $1200.00 is about right for a replacement. This should be the last question, if there is nothing else I should look out for.. And I thank you again for the feedback. What does the evaporator do? Is it a critical part or something the can be ignored? Other than checking for a leak, will I be able to tell if the evaporator is bad just by driving around or listening to the motor? A: I agree with Mr, Tech. You can torque them with Torx driver. A: There's no doubt the tires need replacing. I would replace all four, unless the rears still have sufficient treads left. Make sure to buy tyres that are rated at least "V" (my 850 has Yokohama (my home town) A550V). Don't try to save money on cheap tyres, go with name brand's V-Z rated high qualitytyres. Also, check the tyre pressure, and have an alignment done. Front alignment is straight forward and can be done at generic shop for $70 or so. However, with the car's mileage & age, I would have it done at Volvo dealer, as the rear transverse control arm is eccentric and generic garages may make it worse. If the rears are out of spec, they produce side thrust, which affects steering. Light feeling in the front, I agree with Mr. Tech. It's probably torque-steer, notorious for Swedish cars (Volvo & Saab) with FWD. If not, it could be worn-out suspension components. Evaporator is a part of the A/C system. It is embedded deep in the dash, and it takes heat out of the interior, as the refrigerant vaporizes inside evaporator and absorbs heat. Because it cools down, it collects moisture and usually this collected moisture is drained overboard via hose. In summer, look at people's cars and you'll see water dripping under the engine. The water is coming from the evaporator drain. Many cars have evaporator right behind the glove box, which makes it easy to replace. In case of 850, it is in the deepest abyss of the dash, and the entire dash has to come out just to get to the evaporator. The parts itself isn't that expensive, but it's the labour that costs a lot. Ifthe car's A/C isn't losing cooling capacity, the evaporator is probably ok. If you don't mind driving without A/C, it's something you can ignore (I couldn't, A/C is a must for a car in my opinion). A: It is one of the following: Headlight bulb, brake light bulb, brake light bulb in the rear spoiler (if equipped). It should be specified in the owner's guide (if the previous owner kept it). A: There is a loose connector/wire. Take the radio out by pushing two tabs on both sides of the radio. Then lookfor loose connectors and wire. If the radio connectors seem ok, it's the speaker side that's having loose connector/wire. A: Follow Mr. Tech's advice. I myself used a half washer (a washer cut in half) under the arm holding nut to change the installation angle. A: Here's what I usually do. Buy a can or two of engine degreaser. Cover electrical components such as the alternator, distributor, ignition wires, etc... with plastic wrap. Spray degreaserdirectly at oily surfaces. Wait 3-5 minutes. Then scrub with dish washing brush, flush down with water spray (not the hose, a bottle of squirter). Repeat the procedure 2-3 times and the engine will be clean. Note that this has to be done with engine off, and the engine must not be hot or cold water may do damage to aluminum/steel parts. Also, after cleaning is done, let the engine compartment air dry. Do not start the engine at least a few hours (I would let it sit for 4-5 hours with the hood open). Clean engine hasmany benefits (locatingfluid leak, dissipates heat better, etc...). A: As to the alternator, mine failed completely at 130,000 miles/12 years and I was stranded in the middle of highway at night. When your odometer hits 110,000 miles, I would replace it. Alternator failure may happen without warning, and if it dies your car won't go anywhere. This may pose threat to safety, and since I'm a safety phobia, I assume it'll fail at the worst possible situation thanks to Murphy. This should be the last question, I wouldn't say that, don't be shy to ask. I too, ask questions once a while. Best wishes for you & your car. Thank God the three of you are on this forum. Truly great advice. I will post pics when I pick her up tomorrow. I hope the seller doesn't back out. He doesn't seem like he really wants to sell.. but wife is forcing. Four cars, two bikes.. the 850 has to go. I am on my 2nd 850 and both my evaporators lasted til around 150K. I can never remember changing an alternator and I know I have never changed a water pump. The 94 850 had 206K on it when the engine went. If I knew then what I know now I would still be driving that one with a different engine. Hindsight always being 20/20. By the way three teenagers learned to drive on that car and I'm known to have a heavy foot myself. Never did find out what was wrong with the engine though. Just started rapping like crazy one day and it was from the lower end of the engine. Shop gave me $800 for it in that shape, and wanted at least $3,000 to replace the engine. These FWD turbo cars take some getting used to driving. We have five in our family and we all love driving the Volvo's, but everyone of us remark about being careful pushing on the accelerator while going around a curve. The car wants to straighten out. That's what they call torque steer. Once you get used to it, it's fine. I love blowing the doors off of fast looking cars with a Volvo! That's why I like my dark grey 84 with the charcoal interior. I looked like an everyday, but it was a sleeper. Whereas my 97 850R looks sportier and faster. Can't wait to see the pictures. Wonder if it's the orangeish red or the red red? Glad to hear it has the charcoal interior. When I was looking for my R that's what I wanted, but the one I found was orange-red with tan interior, and the wife shot me down from buying it. Something to the effect that "who do you think you are, the Dukes of Hazard", and she thought it would clash with the burgundy V70 when sitting in the garage. I honestly thought she was kidding until I was actually leaving the house to go look at it. She was NOT kidding, and then my oldest daughter agreed with her and I was done. I honestly thought she was kidding until I was actually leaving the house to go look at it. She was NOT kidding, and then my oldest daughter agreed with her and I was done. Last edited by rspi; 11-16-2011 at 06:05 PM. Reason: codes??? If you don't want A/C then you can Ignore the Evaperator. If there is dye in the system and the Leak is very bad you will see the Dye leak on the ground. It will look kind of like Coolant. Also if there is dye in the system you could also pull the Blower motor resistor and inspect with a Black Light. Yeah, as mentioned earlier, the radio "comes and goes" power to the unit is still there, but connection comes loose. Playing with the radio unit now. pulled it out. Alignment definitely needed. Car pulls to the right.. Driver's side tire is worn on the inside, and the passenger is worn on the outside. What suspension component could this be? It would be a shame to replace the tires and get an alignment, only to find out something's worn down. Other than that, great car. Check the tierods and Balljoints. Beautiful car, definitely worth repairing!! In addition to Mr. Tech's advice, jack up the front end of the car, remove wheelsand visually inspect as much as you can (jackstands are a must for your safety). Not much expertise is needed, simply try to find if there are obvious damage. For tie-rods and ball joints, see if you can find split, torn or damaged rubber boots that allowed grease to escape and dirt to enter. Or before you do this, jack up the front end and try to move the wheels to see if there is a free play/looseness. This usually indicates worn out ball joints/tie-rods. For 850's, usually it's the toe setting that goes out of spec over time/when hitting something big. Other angle settings (camber, caster, etc...) don't seem much adjustable, though there are specs for them. When I rebuilt the frontsuspension and had an alignment at Volvo dealer, the only out-of-spec calibration was the toe settings for both front &amp; rear. It may not have anything to do, but it could be worn out upper spring seats. Did you hear noise from front end? If not, the spring seats are probably all right. Let us know your findings. If you can take close-up photos of suspension with the wheels removed, we may be able to see what's wrong. Just came back from another test drive. Feels a bit sloppy going 110. First thing I'm going to do tomorrow is rotate the tires from back to front to get as much life out of these tires as possible. I will definitely get under there and take a lot of detailed pictures. I know there is an issue on the passenger side. Doesn't seem major, but it will definitely need to be addressed. I will also take some pictures of the engine bay. 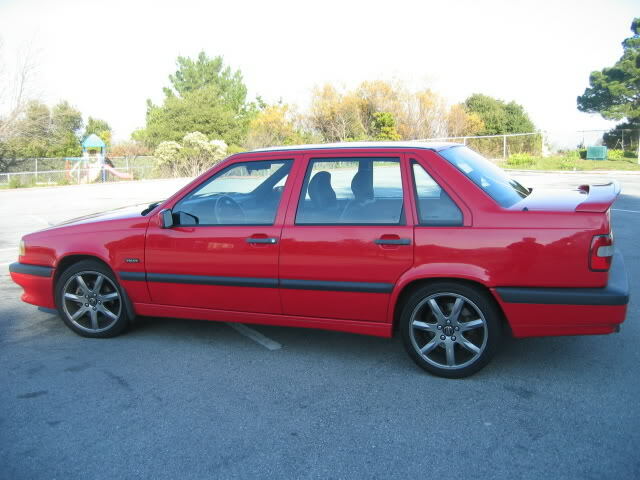 Is there a site similar to this one http://www.realoem.com/bmw/partgrp.d...g=31&amp;fg=05 but for Volvos? I really appreciate all the help. It's always an easier transition when you're buying a foreign car (especially a used one) I'm going to order a Hayes manual and start looking up online manuals as well to keep my questions to a min. on here. Pulled out the radio, unplugged, plugged back the unit. The connection is secure, but it still comes and goes when it wants to. Are the factory radios useless? This is the last of my worries right now. After I tackle the suspension gremlins and make sure the motor/turbo/hoses/etc is perfect, then I'll worry about the radio. Last question for now. Do I need to let the turbo cool down / warm up? This is my first turbo car and friends that have owned turboed cars...WRX, RX-7,etc... always use a turbo timer and such. Is this recommended? Or should I just "give it a minute?" Wopw really great looking car! That's the red-red. I could not find an R that color. White was actually my 2nd choice. I usually let mine idle for about 30 seconds or so when I come off the highway, but aftergoing very slow before stopping I just turn it off. It is good to let the engine idle for a while before turning it off. I think the stereo in my R is one of the best I have ever heard from the factory.From my first Volvo in 1985 I"ve always liked theVolvo factor sound system, although the one in the V70 is not that great.At one time I know they were made by Alpine. If the head unit is bad, it should not be hard to find a replacement on e-bay or from asalvage yard. I have an extra one in the basement from my94, but it does not have the CD player. Hope you find out what's going on with the suspension. I would take it to a reputable place for an alignment and see what they say is wrong.Around here if there is something wrong and I don't have them fix it, I can bring it back after fixing it myself and they will do the alignment at no charge after I fix if myself. I would not let any muffler/brake shop or tire place work on my front end.I would probably either do it myself of take it to ashop that specializes inVolvo's. Looks like you gota really good deal ona very nice looking car. When you rotate the tyres, watch for direction arrow. When I first got my 850, someone rotated the tyres wrong and reversed the direction of rotation, and the rear wheels were so overtorqued that I had to hop-step-jump on a breaker bar (might have been some franchise/generic shop). Also, check the tyre pressure (mine is 35psi max at cold). Tyre pressure can be found either on the tyres' side wall or inside thefuel filler door. If the number doesn't match, go with the number on the tyre. 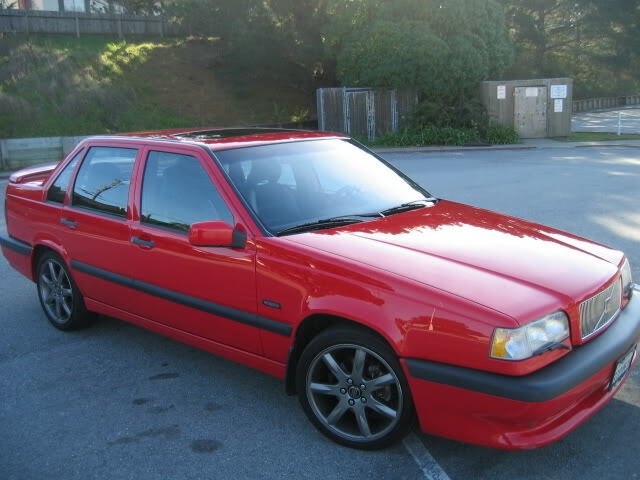 Is there a site similar to this one http://www.realoem.com/bmw/partgrp.do?model=BG93&amp;mospid=47488&amp;hg=31&a mp;fg=05 but for Volvos? 1. FCP Groton (reason why I've been buying parts from them). 2. Volvo dealer. Visit often and get familiar with techs &amp; parts dept, you don't have to have expensive repairs done or buy parts that are overpriced, just keep buying cheap/dealer-only parts . Once you build good relationship, they'll be happy to give you printouts of parts illustrations). Haynes is a good place to start, although I myself find it inconvenient when it comes to complex procedures, as it is not very thorough and they like to say "this work should be entrusted to a Volvo dealer", even forsome simple procedures. Recently, generic manuals have gotten smaller and only the factory manuals seem useful. As to the radio problem, is it just the sound that is cutting out, or is it the entire radio (LCD display turning on/off)? If it's the sound problem only, the problem must be really simple, but if it's the radio itself, the problem might be internal (the radio is probably made in Japan). For audio-related components, I usually clean the connectors with WD-40 (electrical contact cleaner is available, but they are pretty much the same), wipe off excess and spray-dry with a can of air duster. If the radio turns out useless and there is no factory radio available (hate that peculiar size! ), you could install a good aftermarket unit and make the car even better. When working on electrical/electronic components, try not to touch metal tangs/circuit boards with bare hands, as static discharge will damage electronic components. 1. Before driving away, I let the engine idle for about 2-3 minutes or until the coolant temp gauge begins to rise. 2. After highway/hard driving, I let the engine idle for 3-5 minutes. 1. Before driving away, I let the engine idle until the temp gauge begins to rise. This takes aslong as 7 minutes, and some may say this is a waste of fuel but I just don't feel comfortable moving the car when the engine is ice-cold. 2. After highway/hard driving, I let the engine idle for 2-3 minutes. This is probably up to argument and I haven't found a scientific reasons/findings behind it. I just want to TLC turbine/compressor bearing. I would not let any muffler/brake shop or tire place work on my front end. I would probably either do it myself or take it to a shop that specializes in Volvo's. I 100% agree. I don't even let them change oil. Wow every time you drive your car you spend 10 minutes in it idling? I never let mine warm up before starting and I never let it idle more than a minute when I stop. Unless there is a good song on the radio. Not saying I'm right, it's just what I do and there is not way I would spend 10 minutes in the car with it idling. The owners mauals used to tell you to let the car idle for at least 1 minute after hard driving. For the Radio you will need to check and see if the car has an AMP. For the suspension I would say take it to a shop as well to have it fully inspected. Well I jacked up the passenger side and wiggled the tire around. Everything seems snug and there is no play atall. crawled under quickly.. Didn't see anything out of the ordinary. But with the tire on, I doubt I could really get in there. Passenger side shock looks busted. Could a busted shock cause bad alignment? I hope it's that simple, thoughts? For the most part looks pretty good. The shock being busted usually won't throw it off to much. Also put a prybar between the control arm and the hub and make sure there isn't play in the balljoint. Thanks for the photos. Yes, everything looks pretty good, sway bar link rod boots look ok, CV-joint boots look ok, no grease around, so in general they look ok. However, as you could not remove the wheels this time, we are missing the best parts (tie-rod ends and ball joints). One thing that caught my eyes is the shape of the strut lower spring seat in one of the photos. Unless I am mistaken, the front strutsseem different types for right and left. Well, it's unlikely that the previous owner changed only one side, so my eyes might be getting tired. How did you notice busted pax-sideshock (strut)? Any fluid leak, ordoes the front end sit at different height? A busted shock does affect handling, as it cannot stop the spring from bouncing ("shock absorber" is a misleading terminology, it is actually the spring that absorbs shocks and the damper stops spring from compressing &amp; extending so that the car does not bounce around after going over bumps). If you determine that the pax-side strut is definitely gone, I would replace both fronts, and recommend Bilstein Touring (Mr. AxelM noted that Heavy Duty type shocks are too hard &amp; the ride would be harsh. The only thing I don't like about Bilstein Touring is that they allow more roll than I like,otherwise they are great). 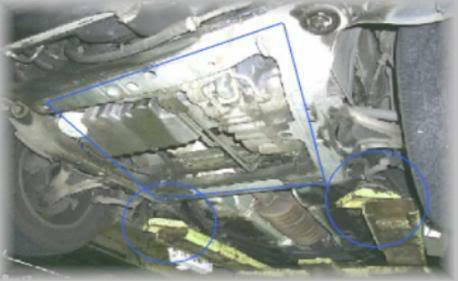 Anyway,if you don't see obvious damage/play, replacing the struts and having alignment done should cure the problem. Please do provide us with photos with the wheels off, and close-ups of ball joints &amp; tie-rod ends. No, the max idling period so far was 7 minutes. My idling period really depends on the ambient temp (the colder the temp, the longer the idle period). The reason I do this is because I want to provide warm oil to the turbine/compressor bearing before driving away and get all fluids going really well (fuel, coolant, oil, etc...). Even though fuel&amp; emission control systems have dramatically changed over the last20 years or so, the basic working theory of reciprocating engine has not changed much, so I just want to idle at least until the coolant temp gauge begins to rise. Many modern cars come with owner's guide that tells you that you do not have to idle and simply drive away slowly after starting, but I don't like driving away when the engine is too cold. After idling is done, I drive easy for 10-15 minutes. What I do may be nothing but waste, but having dealt with many different types of machines (including electronic tube amplifiers), I want to take it easy. No scientific findings/facts behind it, this is all based on my personal preference.